The musicical sensations did not take they music exploits within musical circles only but extended their creativity when they gathered to donate to the Tokwe-Mukosi flood victims. 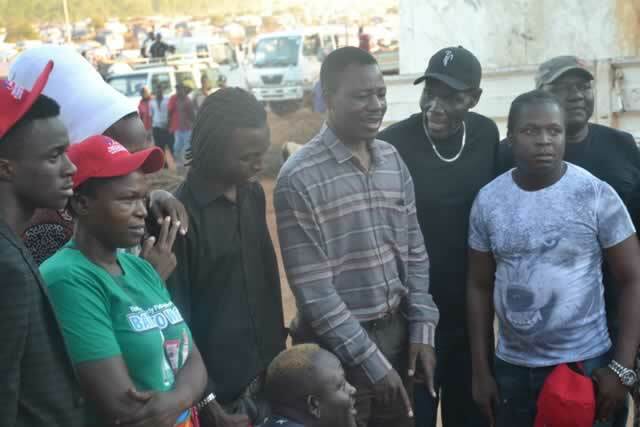 Several artistes visited Chingwizi where the Tokwe-Mukosi flood victims were temporarily settled. Musicians Oliver Mtukudzi, Charles Charamba, Winky D, Leonard Zhakata, Cindy Munyavi, Shiga Shiga, Norman and Jimy of Extra Large, producer Marrian Kunonga and Gary Tight went on the ground to see what the victims are going through. They went around the camp talking to people who poured out some of the problems they are facing. After the tour the musicians expressed their views about the situation. Below are some of the comments from the musicians. Lawrence Chinoperekwi of Devine Assignments who initiated the tour said they took the musicians to the place to have a real appreciation of the situation. “We have taken them here to see what is on the ground and we hope that the show will yield results so that we don’t come back here empty handed,” he said. Assistant District Administrator Elisa Chauke thanked the musicians for the gifts after they brought maize meal and some clothes. “We never thought that you could come here to sympathise with us and we want to thank you for the gifts you have brought to us. Our hopes are pinned on every Zimbabwean to assist us in this situation,” said Chauke.